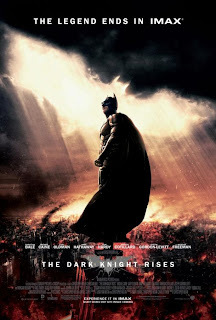 I was not a big fan of Batman character earlier,because i felt all the movies and cartoons were too dark for me with less fun.But when i watched Batman Begins(2005),when i saw the scene where batman lifts a bad guy and answers him in his rough voice "I'm Batman...",i knew i already fell in love with the character.The Dark Knight Rises is the third installment in the Christopher Nolan directed Christian Bale starring series.They said it is the last movie of Christian Bale as the batman and last batman movie directed my Christopher Nolan. I have watched this movie 2 weeks back and i didn't had the courage to write a review without giving away the plot points.But if i don't write about it some of you at least may not come to know the value of this movie.Let me tell you this first itself,it's a must watch movie.And if you haven't seen the first two parts,you must watch them too. Story starts where The Dark Knight(2008) finished.Bruce Wayne/Batman has gone underground because his own city-which once admired him-now says he is the bad guy.He has stopped giving public appearances and lost interest in his business empire.Crime rate of Gotham city is at an all time low.That's when the new villain appears.Bane.Most dangerous villain batman ever faced in these three movies.Can Bruce do anything to stop the crime?.Despite the injuries will he able to be the good old batman who fought with criminals? Or he will be just a shadow of it fail miserably?.This is a movie with full of twists and it is a must watch movie. This movie is filled with brilliantly planned dramatic scenes with jaw-dropping visuals.Especially watch out for scene where Batpod(Batman's Bike) skids across the road.I can assure you,you have never seen anything like that before.Watch till the last second.And one more thing,when you watch the climax i'm sure it will be completely different from what you thought.If you don't watch this movie,you will miss one of the best movie ever made.I cant end this review without talking about contributions of Hans Zimmer, Morgan Freeman and Michael Caine.When Hans Zimmer did what he does best-Creating a background score which make you emote through out the movie-Morgan Freeman and Michael Caine reprises their roles as Mr.Fox and Alfred respectively.Both characters have more importance in this movie than the previous movies.And no one else can play those roles so perfectly than Freeman or Michael Caine.